1. the border of the 1st rib and the anterior and medial scalene muscles. 2. the middle of the clavicle (collar bone), 1st rib and upper scapula (shoulder blade). 3. under the Pec Minor tendon and coracoid process. What signs and symptoms might indicate TOS? - Pins and needles, numbness, tingling or weakness in the shoulder, arm or hand. A physiotherapy assessment is crucial in negating all other possible diagnoses and assists treatment, management and onward referral if necessary. 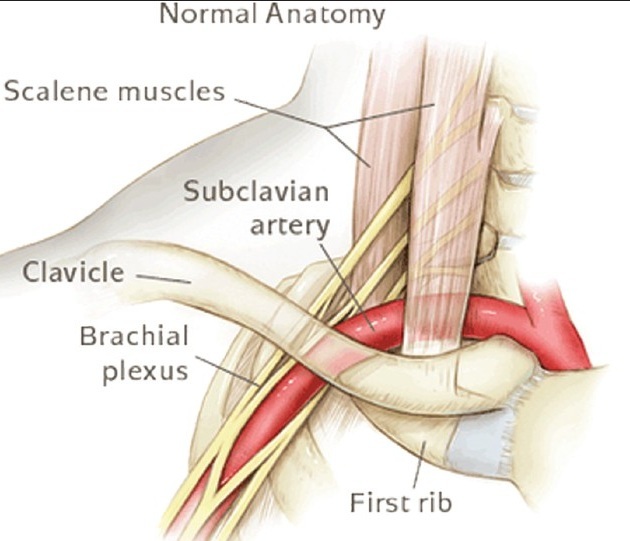 Thoracic Outlet Syndrome is very rare so ruling in or out any other likely causes of your pain is critical. Conservative management should always be trialled initially to reduce symptoms and improve function and return to work before considering if further imaging may be required and/or if a combination of allied health professionals will be required to assist with overall management.